"I order them for employee's who have babies. Everybody loves them! They love the personalization that comes with your products! Orders are made and handled quickly." "It website is so easy to use and the products are so nice!" "THis was bought as a gift, but I was told it was very cute, quality made." "Very cute, as pictured. 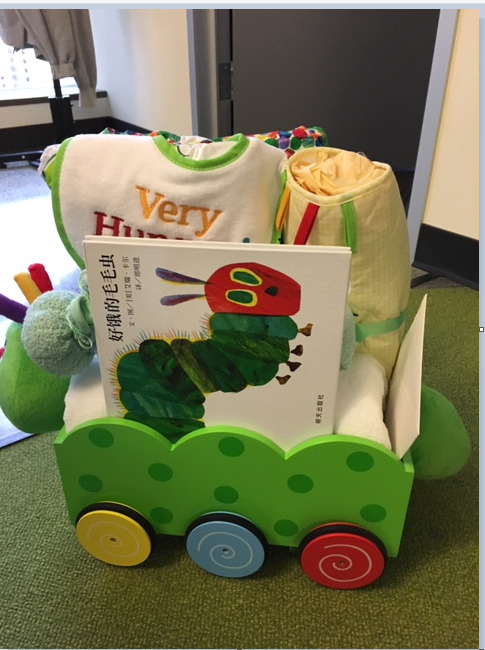 I combined it with a Very Hungry Caterpillar book and quilt and it made a very nice office gift." "The website was easy to navigate and many items and baskets to choose from. The recipient was very pleased with the items. Overall, I would use again for employee gifts. " "our experience went smooth. Friend LOVED her gift"
"Love these little books for baby. It lasts for a few years. Adorable Teddy Bear.... Thank you for your products!" Everyone in office loved personalized gift! Looked exactly as pictured! "Great, communication via e-mail from moment I placed order until the end was easy, I even made a mistake with the address and customer service fixed it easily. The gift was great quality and delivered in the middle of a ice storm. Thank you!" "Very good. They were helpful. Letting me know the process and product was good qualty and beautiful." Easy gifts for busy parents! "The delivery was quick, items were all useful, and basket was very cute. The recipients were pleased." "Outstanding company! These little books will be read to the infant to toddler for many years... so sweet!" "excellent and the family loved the gift "
"Excellent would definitely recommend this company "
"The feedback from the recipient was very positive and appreciated. Having received something similar, I like that it offers a number of things that can grow with the little one and be enjoyed over time." "Prompt service and a good quality product." "We sent this gift to a co-worker and she loved everything! It was simple to order and delivery was timely. I will definitely consider buying from you again." "Best gift ever. It’s a mouthful "
"I appreciate the variety of this gift - it has many uses!" "The teddy bear and blanket were soft. Great gift." "Recipient of this gift basket was very happy with it, and found all items useful for her baby girl. Shipping was timely. Would purchase again." "All the baby items were of good quality"
"We used these for favors we made for a baby shower. The,e was connected to travel so these worked out perfectly." "We used these for favors we made for a baby shower. The,e was connected to travel so these worked out perfectly. " "I contacted the person who received the gift, and she was very pleased. Thank you!" "5 stars⭐⭐⭐⭐⭐Will def buy again!! Great customer service and beautiful craftmanship!!"